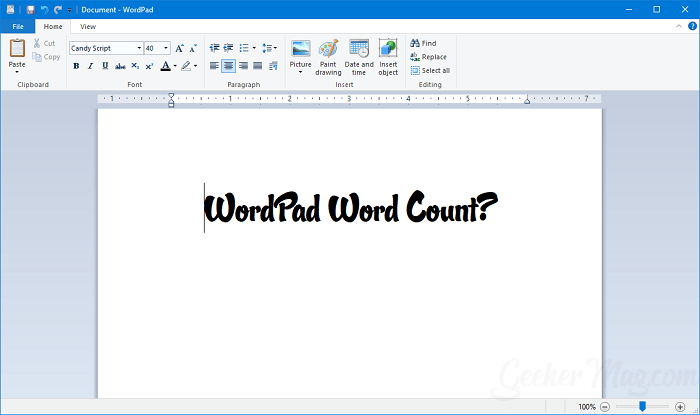 Want to calculate Word count on Wordpad document? The following post has various ways on how to check WordPad word count. WordPad is a basic text editor developed by Microsoft’s. It is a favorite word processor that comes preinstalled in all the version of Windows operating system released by the Microsoft from Windows 95 to Windows 10. WordPad is more advanced in comparison to Notepad which also comes pre-installed on Windows operating system. With the help WordPad, users can edit and create a document which requires better formatting and punctuation. It is a basic word processor which is very simple in comparison to Microsoft Words and is much advanced if we compare it to Microsoft Notepad. 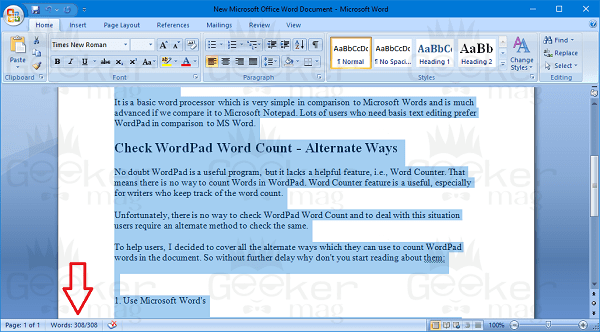 Lots of users who need basis text editing prefer WordPad in contrast to MS Word. No doubt WordPad is a useful program, but it lacks a helpful feature, i.e., Word Counter. That means there is no way to count Words in WordPad. 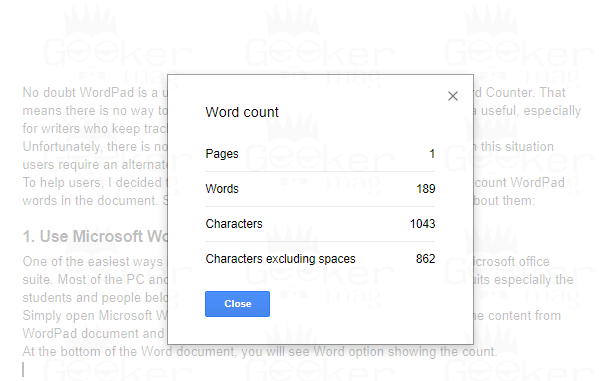 Word Counter feature is a useful, especially for writers who keep track of the word count. Unfortunately, there is no way to check WordPad Word Count and to deal with this situation users require an alternate method to check the same. One of the easiest ways is to take help of Microsoft Word which is a part of Microsoft office suite. Most of the PC and laptop owner prefers to purchase Microsoft office suits especially the students and people belongs to the corporate sector. At the bottom of the Word document, you will see Word option showing the count. 3. In the Online Word text editor paste the WordPad document text, and at the bottom of the page, it will show you the word count. Microsoft Word is a Part of Microsoft Office suite which cost you money. 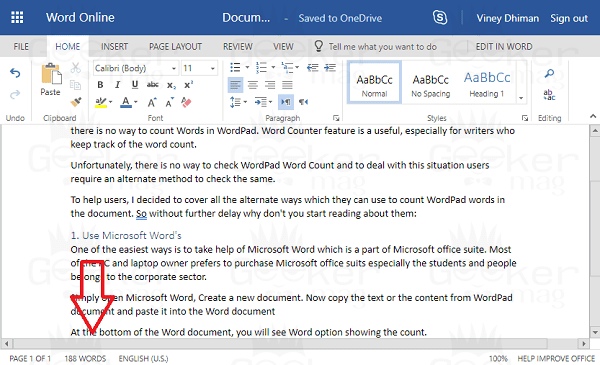 So if you don’t want to purchase the office suite just to calculate word count, then you can use free Word Processors available on the internet which also offers functionality to calculate Word count of the document. The Jarte and OpenOffice.org, both are free options and can be used for the same purpose. You just need to visit the Google Docs and log in using your Google account. 2. In the Document copy and paste the WordPad document text. 3. Click on the ‘Tool‘ -> ‘Word Count‘. This will bring a dialog box showing you Word Count accompanied by other things Pages, and the Characters. Alternatively, you can use “CTRL + SHIFT + C” keyboard combination for the same. There are various tools, but these are simple tools to calculate word count. All of them works on the same principle. You just need to visit the website, copy and paste the WordPad document text and when you click on the Submit button. You will get the Word count of the WordPad document. So these are the alternate ways on how to count words in WordPad. In case, if you have any easiest method to check WordPad word count, then feel free to share it in the comments.